I'm a khek or hakka who does not speak the language nor follow any of the dialect's tradition as my dad did not expose us to either of them. The only khek dish that I have tasted was the Hakka Abacus Seed or the vinegar pig's trotter until a few months ago I chanced upon a khek cookbook in the local book store and brought it home. Since then I've cooked some of the dishes (Its labelled under 客家村食谱 in my blog) in the cookbook and I must say they really have their own unique taste and texture. Today I am sharing one of my favourite food, aubergines or egg plant. This bright purple vegetable is perhaps not every one's favourite because of its texture. 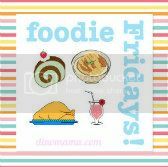 I like it very much, especially my mum's version where she will stir-fried it with dried shrimps and chilli, I love the sauce which goes well with steaming white rice. I was surprised to find a aubergine dish in the khek cookbook, its a different style from mum's but nonetheless as tasty. 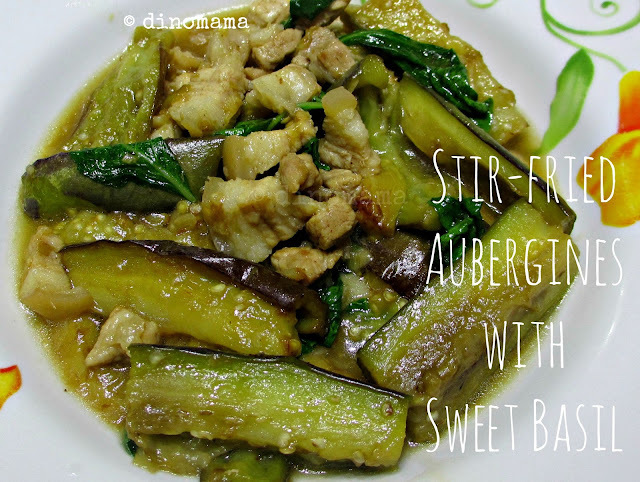 The unique part of this recipe is that the aubergines are cooked twice, first deep fried to seal in the juices making them crispy on the outside but moist on the inside, then follow by quick stir-fried with the seasoning and basil. A word of caution while deep frying the aubergines, oil blanch them in the hot oil for probably around 30 seconds or so otherwise they will turn out like mine in the photo, a tad too dry and too brown. Such a beautiful dish isn't it? Even DinoPapa & DinoUncle#2 said that it tasted good. If you are not a pork belly fan, you can replace it with either minced or sliced pork, the taste should not differ too much. 1. Heat up the cooking oil in pan. 2. 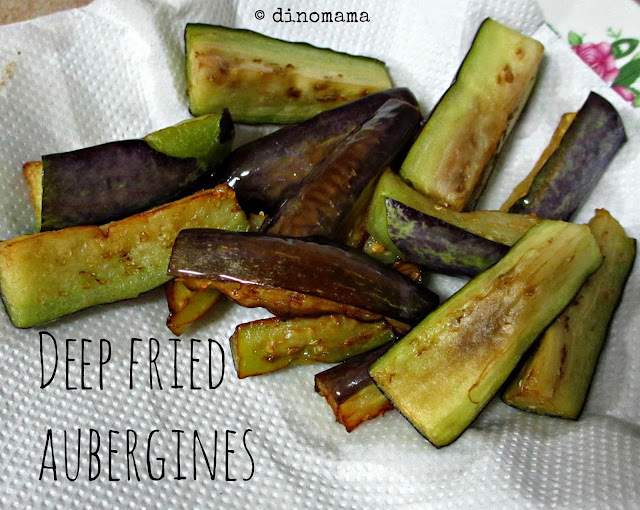 Cut aubergines into stripes, deep-fry them in the hot oil until aromatic and golden brown. Drain well. 3. Leave about 1 tablespoon hot oil in the wok to sauté garlic until fragrant. 4. 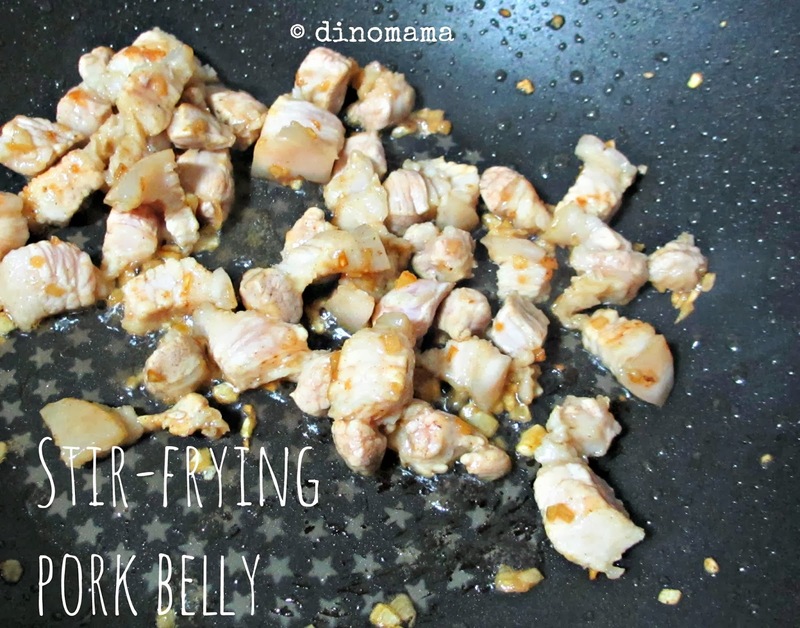 Add the pork belly, stir-fry briskly until aromatic. 5. Add the aubergines and seasoning, stirring until well combined. 6. Add water, bring to boil, simmer it until the gravy is almost absorbed. 7. Add in sweet basil, stirring constantly until well combined. Serve hot. Next up on the What's cooking? blogtrain is Winnie Lee of Toddly Mummy who will be sharing with us her Shanghainese wonton. In contrast to the local version, Shanghainese wontons resemble ingots. These are handmade (except for the skin) and hand wrapped, and are usually consumed as a main dish. Here is the link for my soup tonight....wasn't sure how to link in!